Occupational Therapy colleagues at St. Peter’s Hospital held their annual “Carnival” on Thursday, April 11, to celebrate Occupational Therapy Month. 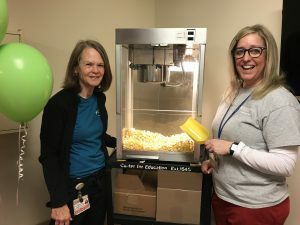 The event included OT-based skill challenges, popcorn, prizes, and a variety of raffles to benefit The ALS Regional Center. Thanks to the generous donations from visitors and staff, the event raised $200. Staff would like to thank everyone who took the time to visit the exhibit and for their donations. 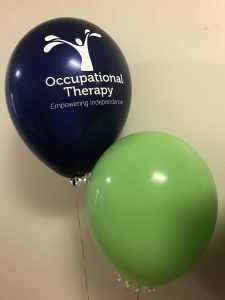 Occupational Therapy Month, celebrated every April, raises awareness for the profession and all the benefits this specialized healthcare provides. Kris P., an employee, won the kitchen gadgets basket. MaryAnn R., a visitor, won the mindfulness basket. Jerry B., a visitor, won the 50/50 raffle.